Jodi Seidler from Hipster Club shares her tips and insights. Just like baby proofing your home, it’s important to prepare your home for your hip replacement. Joint Replacement Clinics – Search here! 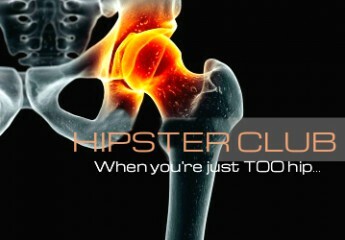 Find a Doctor, hospital or Doctor that uses the manufacturers that you want in your hip or knee! “Whether the weather be cold, or whether the weather be hot,” as described in a poem my daughter Katie memorized in first grade, it can have a big impact on health, especially for people with chronic medical conditions like migraines or asthma. Since mid-December, Bay Area residents, and others in the U.S., Canada and the United Kingdom who suffer from migraines, arthritis, asthma, diabetes and heart conditions, can opt for free, localized weather warnings. Using such information, they can either stay indoors, make sure they take their medications, or take other steps to avoid potential weather-triggered difficulties. The MediClim.com web site, created by Dr. John Bart and meteorologist Denis Bourque, sends localized warnings 24 hours before Bay Area conditions change in ways that could contribute to chronic health problems. He says U.K. studies have shown that such early warnings can cut hospitalizations for chronic conditions by 20 percent. From the lens of a patient who recently experienced major surgery, I now realize how difficult it is to be participatory when you are in pain and taking large doses of pain medication which dulls the senses and puts you in a place where you are not really thinking about anything but how to get through the next couple of days. I consider myself to be an empowered patient who fully participates in my health care, questions my clinicians, and evaluates the risk/benefit of treatment plans presented by my clinicians. I use the health data my clinician offers, including the reports and notes that are in my electronic health record, and confer with people who have had some experience with the same or similar conditions. I always go one step further and search the web for relevant information that applies to my particular health concerns. I provide feedback to my doctors and never hesitate to speak up and ask questions. I tap the wisdom and advice of my peers and encourage my providers to be participatory. As social media in the pharmaceutical and healthcare industry becomes more widespread, a growing trend is ePatient communication. The internet has become the go-to source of information for many people; that holds true as they research diagnoses, check up on current research, and connect with others for support. Citizen bloggers, with a particular diagnosis, educate themselves, and are a key source of information for others with a similar diagnosis. In the digital age, where nearly everyone has a smartphone, these “man on the street” blogs offer a personal voice, answering questions and addressing areas of concern, as well as offering support. Patient bloggers, read by a wide range of patients and caregivers, can be a key source of internet buzz, when they offer a review or opinion on a new therapy or drug treatment option. Pharmaceutical companies can network with these bloggers, gaining both a platform for patient marketing, but also a window into the concerns and trends patients notice. Many Americans turn to friends and family for support and advice when they have a health problem. This report shows how people’s networks are expanding to include online peers, particularly in the crucible of rare disease. The most striking finding of the national survey is the extent of peer-to-peer help among people living with chronic conditions. One in four internet users living with high blood pressure, diabetes, heart conditions, lung conditions, cancer, or some other chronic ailment (23%) say they have gone online to find others with similar health concerns. By contrast, 15% of internet users who report no chronic conditions have sought such help online. When asked about the last time they had a health issue, however, 71% of adults in the U.S. say they received information, care, or support from a health professional. Fifty-five percent of adults say they turned to friends and family. Twenty-one percent of adults say they turned to others who have the same health condition. The oft-expressed fear that patients are using the internet to self-diagnose and self-medicate without reference to medical professionals does not emerge in national phone surveys or in this special rare-disease community survey.